In the above schematic, the relay’s coil is energized by the low-voltage (12 VDC) source, while the s ngle-pole, single-throw (SPST) contact interrupts the high-voltage (480 VAC) circuit. It is quite likely that the current required to energize the relay coil will be hundreds of times less than the current rating of the contact. Typical relay coil currents are well below 1 amp, while typical contact ratings for industrial relays are at least 10 amps. While relays are essentially binary devices, either being completely on or completely off, there are operating conditions where their state may be indeterminate, just as with semiconductor logic gates. In order for a relay to positively “pull in” the armature to actuate the contact(s), there must be a certain minimum amount of current through the coil. This minimum amount is called the pull-in current, and it is analogous to the minimum input voltage that a logic gate requires to guarantee a “high” state (typically 2 Volts for TTL, 3.5 Volts for CMOS). Once the armature is pulled closer to the coil’s center, however, it takes less magnetic field flux (less coil current) to hold it there. Therefore, the coil current must drop below a value significantly lower than the pull-in current before the armature “drops out” to its spring-loaded position and the contacts resume their normal state. This current level is called the drop-out current, and it is analogous to the maximum input voltage that a logic gate input will allow to guarantee a “low” state (typically 0.8 Volts for TTL, 1.5 Volts for CMOS). 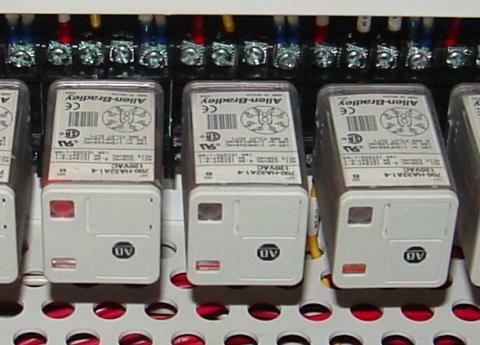 A relay is a solenoid set up to actuate switch contacts when its coil is energized.